It all started a couple of days ago, when I watched an episode of last week’s Dans la Peau d’un Chef, and I felt like trying the apricot compote (I’ll try the waffles another time). And as it happened, I had apricots in the fridge!!! I decided to use the idea of Christophe Michalak’s Kosmiks dessert, i.e. a creamy base, a crunchy element and some fruit on top (that’s a rough description but you get the idea). I also wanted to make a lighter version than that offered by the chef at his shop, and something more adaptable. This is the reason why I started with a base of Greek yogurt. Now, I insist – I’m not trying to be chauvinistic here, but you’ll need a yogurt that has some body so it remains creamy when you whip it. So ideally, go for real Greek yogurt (such as FAGE). Start by making the compote: Preheat the oven to 220°C/425°F. Cut the apricots into quarters, leaving the skin on. Brush over some melted salted butter. Sprinkle the sugar and lemon zest, and drizzle over the lemon juice. Bake for about 10 minutes or until soft. Once the apricots are ready, put them in the fridge to cool. In a bowl, mix the yogurt, sugar, lemon juice and lemon zest. Adjust the sugar/lemon to taste if needed. Take the apricots from the fridge. On a chopping board, remove the skin using a knife, and chop the apricots finely. Divide the yogurt between 2 glasses. 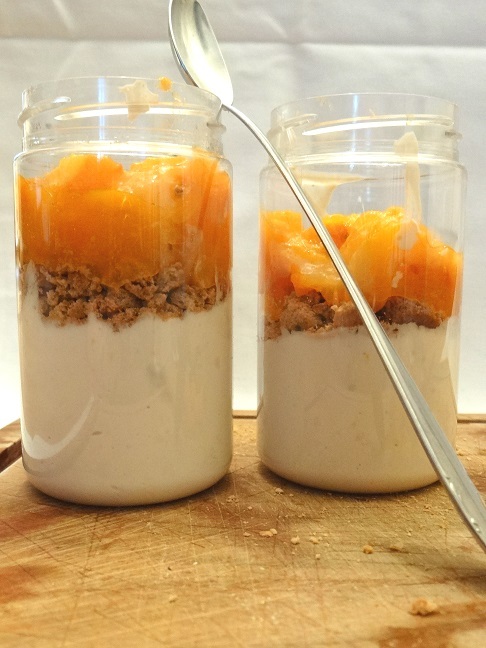 Top with the biscuits or granola, and then the apricots. If you want more crunch, you can add roughly chopped pistachios.